Jesus draws upon the imagery of a reed in the desert to talk about John. A reed was on the coins of the local king Herod, so Jesus was saying subtley, “Did you go into the desert to see a new king of Israel?” Jesus acknowledges the political questions that surround him and that he is a political conundrum too. 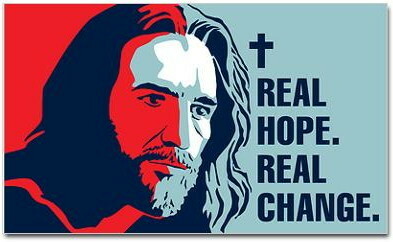 Many people avoid seeing Jesus as a political figure because they have a strong division between religion and politics. Politics has something to do with secular, public life whereas religion is private and personal. However, Jesus is bringing social reform that comes from a transformed heart. We can not avoid the fact that Jesus brings political public change and demands a government of his own which changes people from the inside. We elect him by opting out of the corruption in society, but we do not opt out of society. We bring the good that a transformed heart will bring and so we are greater than the greatest in other religious or political systems because we bring true life-transformation. Democrats and Republicans promise change. Labour and Conservatives promise reform, but Jesus brings powerful change that really makes a difference. Why, then, do so many people give up on the change that Jesus brings? They give up because they see Jesus as an agent for the change they desire. They see Jesus as one who will be a citizen of their own kingdom. Jesus does not kowtow to us. Jesus does not play by our rules. Before we criticize Jesus for not playing by our rules, we ought to see that was never the deal. God makes an offer through Jesus for His kingdom to come on Earth. We find his peace when we submit to his rule, not when we control and dictate, but when he does. No-one elects Jesus and puts him up for review. Jesus may graciously show us what he is doing, but he does not have to. Let me not look to a world system, a wife, a family or education to save us. No system can provide the true turn around that you provide. I want to know you and walk with you, but sometimes, like John, I have my doubts. Thank you that you have provided answers. Let me trust them. Why does he need assurances? What does Jesus say as his ‘talking points’ when asked about his ministry? How do other religions and systems claim to bring real change today? How have those you know experienced change that can only be attributed to God?